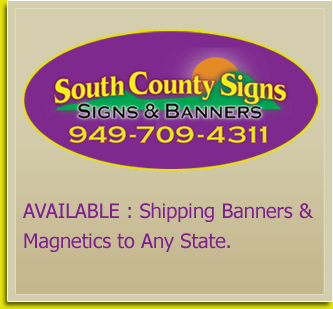 South County Signs & Banners is your #1 resource for Signs, Banners, Vehicle Lettering, Vehicle Magnetics, Full Color Digital Printing and Store Front Lettering. We offer FREE local delivery and have a fast turnaround for all your last minute signage needs. We can be reached at 949-709-4311 or email us at either scsigns@cox.net or southcountysigns@cox.net. If you are not familiar with our company and your first contact with us is online: We would be pleased to hear from you! Please let us know what your needs and questions are, we will be more than happy to help you. In brief, you should know the following about us: our company was established in 2002 and had been responsible for providing outstanding service in signs & banners ever since. Our regular customers particularly value our quick service and low prices. Our business is located in South Orange County.